FINALY, A YOGA MAT THAT GOES WHERE YOU GO. Take this mat along with you for your travels. At just 1.4 pounds, this mat can be easily rolled up and stored in your carry-on, or takes up minimal space in your closet or car. REVERSILBLE AND FUNCTIONAL, IDEAL FOR ALL LEVELS OF YOGA. This yoga mat for adults, women, men and even children has a cushioned surface and can be used for yoga, Pilates, hot yoga, fitness or any type of training. Simply flip the mat over for a different design, it's like having two mats in one! 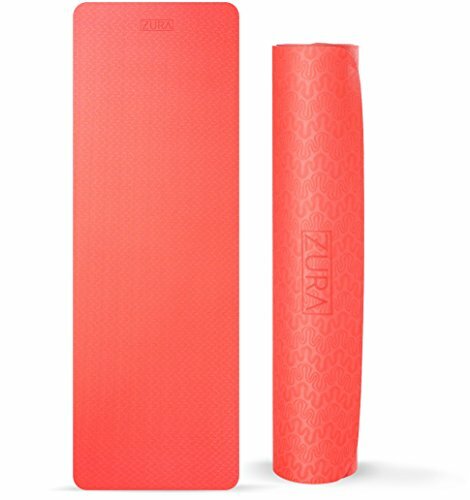 THIS SUPERIOR TRAVEL YOGA MAT IS THE PERFECT FOR YOUR PRACTICE AND SAFE FOR THE EARTH. This lightweight yoga mat is mindfully crafted with the environment and your practice as a top priority. No PVC, Phthalates, toxic plasticizers or harmful dies and made of biodegradable TPE material. HYPOALLERGENEIC, DURABLE, VERSATILE AND PORTABLE YOGA MAT. This is the perfect anytime yoga mat, makes a great gift for yogis, too! LIFETIME MONEYBACK GUARANTEE. If you decide "it's not me, it's you," no problem! We want you to be 100% satisfied and will gladly issue you a full refund. ECO-FRIENDLY MATERIAL. This ecofriendly yoga mat made from 100% recyclable, biodegradable TPE material. Free of PVC, phthalates, silicone, and latex. REVERSABLE YOGA MAT WITH INNOVATIVE, SLIP-FREE TECHNOLOGY. No more slipping and sliding around during your practice! Textured lines and groves help you grip on your hands and feet, while effortlessly giving you the freedom to glide form one pose to the next. EASY TO CLEAN YOGA MAT FOR STORING IN YOUR CAR, STUDIO, OR AT HOME! Closed-cell technology makes this mat easy to clean. Simply wipe down and let it dry for a few minutes, then roll up to store anywhere! 100% RISK-FREE,LIFETIME MONEY BACK GUARANTEE. Your happiness is our top priority. If you are not completely satisfied with your new yoga mat, simply return it for a full refund. If you have any questions about this product by ZURA, contact us by completing and submitting the form below. If you are looking for a specif part number, please include it with your message.